This breakout board contains a 68-pin half-pitch D-type connector. Each of the 68 connector pins is brought out to screw terminal blocks, allowing connections to be made easily. Each pin is also brought to solder pads (2 per pin) at 0.1" spacing, allowing easy addition of 0.1" pin headers or other components. Please note that the breakout boards are manufactured with a connection between each connector pin and the corresponding terminal block position; no soldering of any type is necessary. The solder pads simply provide an area for making optional connections to additional headers or other components. 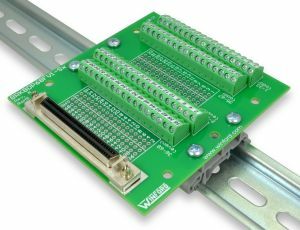 National Instruments™ uses the 68-pin half-pitch DSUB connector on some of their DAQ cards and accessories. This Winford breakout board is a good option for interfacing to these National Instruments products. Note that NI™ actually uses two different styles of 68-pin connectors: the VHDCI, and the half-pitch DSUB (0.050 D-type). For more information on VHDCI connection products, please see our BRKAVH68FV1 breakout board page. 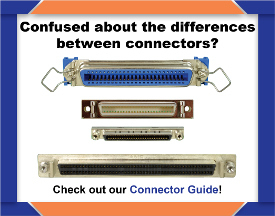 See our connector guide if you need help determining which type of connector you have. National Instruments offers several 68-pin half-pitch DSUB breakout boards with varying layout and functional options. The Winford BRKBDP68FV1 and BRKBDP68MV1 breakout boards are very similar in function to the basic NI models CB-68LP and CB-68LPR. The main difference is that Winford offers both Male and Female connector options, while the NI offers only a male connector board. This may affect your cable selection. These breakout boards are general-purpose in nature and useful when interfacing to a variety of equipment. The 68-pin HPDSUB connector has traditionally been known is the SCSI-3 (SCSI-III) connector. It is also used in data aquisition and I/O applications. Winford Engineering offers 68-pin Half-Pitch DSUB (SCSI) cables (shown below) which are compatible with these breakout boards.